I would have never survived in the mafia. Sometimes I am so unaware of my surroundings that I'm ashamed. My boss walked with me into the office, and as he opened the door to the shop in the back, I heard a loud "Surprise!!!". I felt the urge to start clapping for John and immediately started to feel worried that I had forgotten about some sort of surprise party for him that I was supposed to be at! Then I looked at the cameras, and they were pointed at me. I don't have the pictures yet, but I'm guessing that my face is going to look pretty darn funny in those. 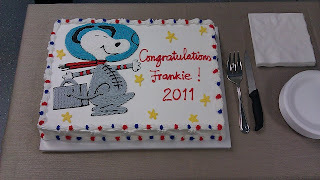 Everyone at my company METECS, was there to surprise and congratulate me on a Silver Snoopy award from NASA. If you've never heard of it, it is a fairly prestigious award given out by an astronaut to an employee that has contributed to safety or mission success in human spaceflight. 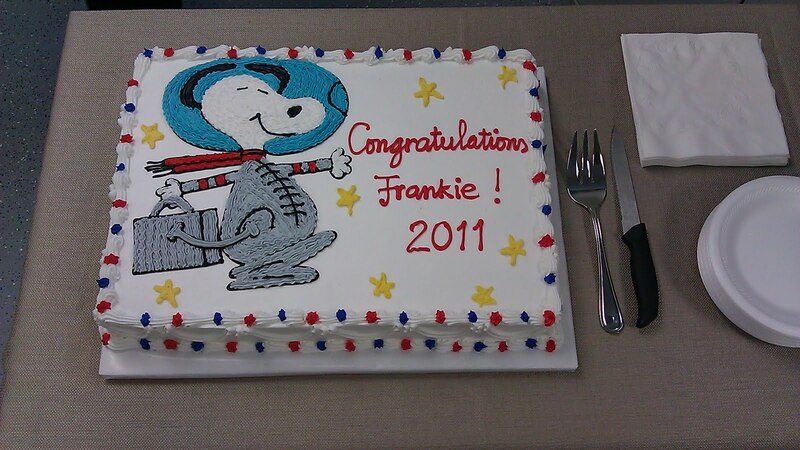 Snoopy is the mascot, so-to-speak, of NASA's human spaceflight program. The award is named after a silver pin of Snoopy that flies on a space shuttle mission and comes with a certificate to say where and how long it flew. The award is not for management, and you can only receive one. For folks who work at Johnson Space Center, it is a pretty big deal to get one. And so, looking back, there were a million hints that something was off. Things that happened that morning. Doors in the office that were locked that never normally were. My boss drinking coffee and not worried about being late to our staff meeting. 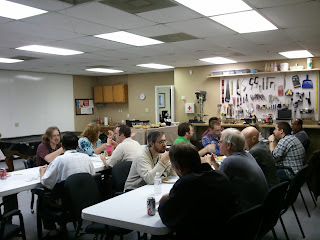 The moving of the staff meeting time. All kinds of things. I was blissfully unaware. My brain was running wild, but about a problem I was working on at work to support an upcoming demo. Never once did it think about the odd things that morning, or that people may be planning something concerning me! The fact that I was thinking about work that morning speaks to how much I love my job, and how much fun I have at work. I find myself in a unique position where my work is rewarding and important, but also free enough to discover and learn new things constantly. My coworkers are amazing. The projects I work on are really cool (sometimes you have to stop and step back from them to realize how cool they are). And while working at NASA has some downsides, it is far outweighed by how many good things I have with my work. I am truly blessed, and try to remind myself of how lucky I am - particularly when we are living in a time where so many are without work, without meaningful work, or without happiness in their work. My award ceremony is in a couple of weeks, so I don't know exactly which astronaut will be presenting, but I am pretty excited.